There are many dangers that threaten our natural- and cultural artifacts and it’s these dangers that conservators work to prevent. Among them are sunlight, water, heat, mold, insects and rodents. All these elements have a bad influence on objects and make them deteriorate faster. We all know what happens if you leave a colored t-shirt in the sun for too long or wash it repeatedly. The t-shirts color becomes faded and boring and it’s the same things that happen to museum objects if left in the sun or if people repeatedly use the camera flash on the same object in the exhibitions. 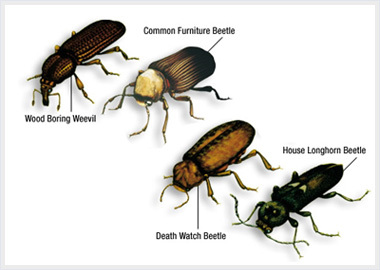 Small insects can also pose a great threat to objects and they are very hard to get rid of (as anyone who has tried a termite, ant or bedbug infestation in their own home knows). Insects can multiply very fast and feed off the museum objects and if they are left alone they can completely destroy objects. 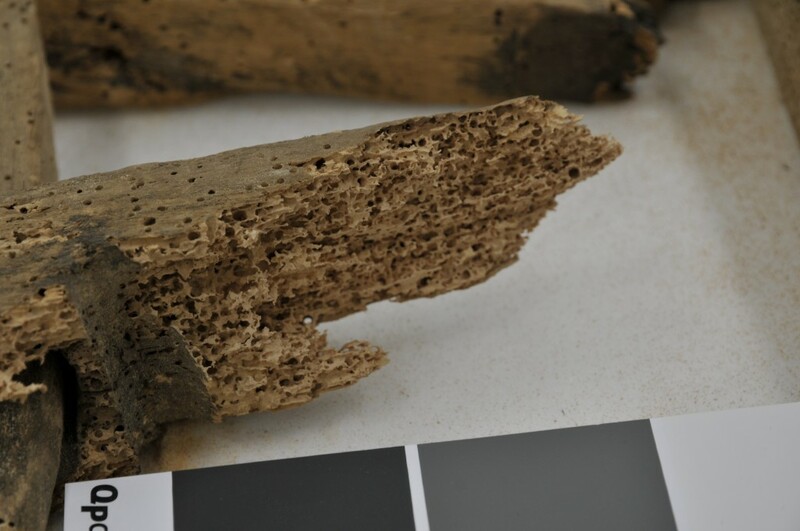 The picture underneath demonstrates how insects (in this case woodworm) can completely undermine the woods structure, and thereby destroy the object. The picture under shows different species of woodworm as adults (woodworms are worms when they are born and mature into beetles like the ones on the picture). In the past objects were sometimes treated with pesticides containing arsenic, mercury or lead to protect the objects against harmful insects. Today this practice poses problems to conservators as arsenic, mercury and lead are all toxic to humans as well as to insects and museum staff in the past weren’t very good at recording what they did to which object. That means that conservators today have a hard time knowing what objects have been treated with these components and which haven’t. Today conservators use biological and mechanical non-toxic ways of preventing insects in museum collection but they can sadly never be completely avoided and they will always be a great danger to cultural artifacts.